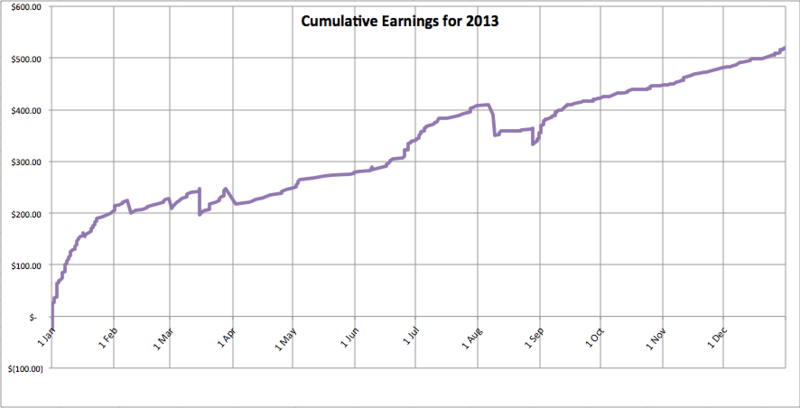 In the spirit of openness, here are my sales for 2013. I hope this will be useful to others who are interested in selling tabletop games. I sell nearly all my games and products on DriveThruRPG. I take a scattershot approach: I make many different games and books, then sell them and see how they do. Nearly all my releases are PDF. For the last few months of 2013, I started including eReader formats (.mobi, .epub, and .azw3) in my releases as well. Note that all the numbers I use here are actual revenue, after commissions and fees. The Old School Renaissance Handbook (which describes over a dozen old-school-style tabletop RPGs) clearly spanked all my other products, making literally an order of magnitude more money than any of the other products. Heck, it made twice as much money as all my other products combined. Interestingly, this is the only non-fiction product I’ve published. My next most popular product is Dungeon Delvers, an OSR system, followed by DROP, a simple science fiction storytelling game. Dungeon Delvers was initially released to my patrons on Patreon, then released to the general public. Note: I have not included Patreon revenue in any of these reports, partly because I forgot, partly because of the irregularity of its payments, and partly because Patreon automatically deducts outgoing pledges from incoming ones. I’ve only made a total of $20.01 through Patreon so far, so its impact is negligible. I’ll do better about counting that in future. Mystery of the Shattered World is a setting book that I plan to release in 2014. I’ve been paying for art and editing work this year, which explains its deficit. I hope to make enough to offset its $170 cost. Bounty Hunter Blues is a Fiasco playset, and Ability Score is a one-page, genre-agnostic system I released for fun in December. All the other products shown above were published in prior years, which explains their negligible sales. This was also the year that I opened a business checking account and changed all my accounts to deposit directly there. So now, all my RPG finances are handled separately from my personal money. That is a big relief. There’s a bigger question to be answered, though: how well am I doing? This is the most important chart of the year, showing sales as a cumulative line over the year. Every sale bumped the line up, and every expense pushed the line down. You always want that line to move upwards over time. It looked scary in the first half of the year, then I released another edition of the OSR Handbook and got a nice jump in sales. Further expenses for Mystery of the Shattered World pushed it back down, but the releases of DROP and Dungeon Delvers pushed the line back up. I’m very lucky to be making money from my games. Old school sells. I’ll work on another OSR product for 2014, and a third edition of the OSR Handbook. Non-fiction sells. People pay for analysis more than systems. I think the market’s saturated with systems anyway. I’m doing fine. I should push more money back into art and other such things for future products.